Blue skies, great food and great wine brought out the crowds. 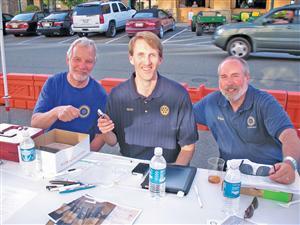 Sunshine welcomed guests to Wine at Town Center Saturday. The fundraising event hosted by the Rotary Clubs of El Dorado Hills and Cameron Park was rescheduled from June 4 to June 25 after rain washed out the first date. Mother Nature couldn't have provided a more perfect evening this time around. Hundreds of people attended the annual event that featured dozens of wineries and restaurants, as well as live music and friendly conversations. Couldn't make it this year? Mark your calendars for June 9, 2012.